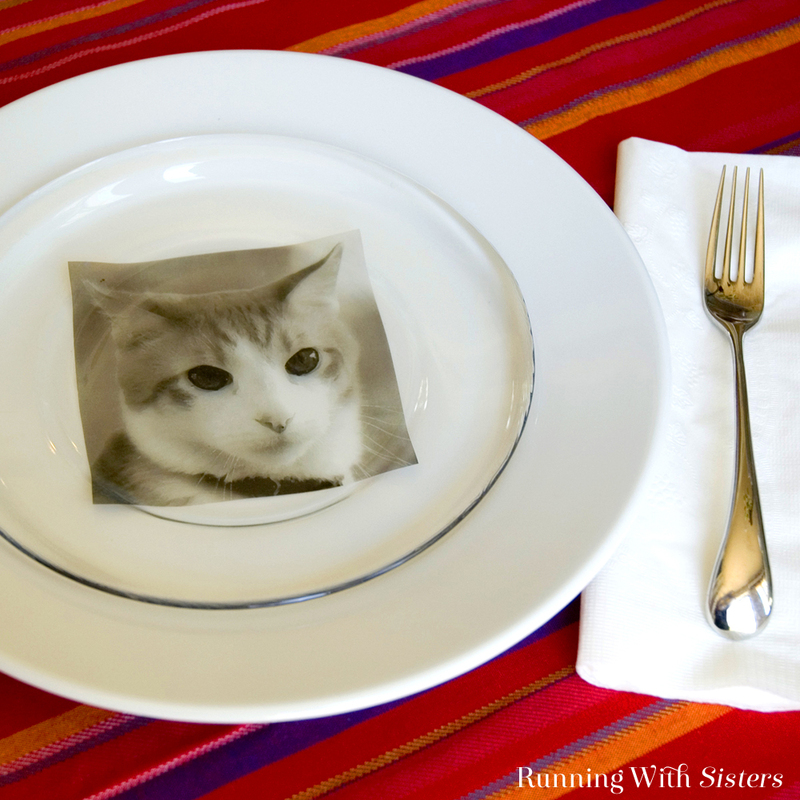 Create the purrfect set of dessert plates using images of your pet! 1. To create the art for the plates, have your pet’s photos copied onto the Lazertran sheets using one of the Lazertran-approved printer/copiers listed on the package. 2. Skip the package instruction to pre-bake the Lazertran sheet. Instead, remove the Lazertran decal from the backing paper by soaking it in a casserole dish filled with water. Slide the backing off, being careful not to rip the decal. 3. Carefully apply the Lazertran decal to the back of the plate with the toner-side touching the plate. Squeegee out all the air bubbles and water from under the decal. (Use a paper towel to keep the water from seeping back under the decal.) Sprinkle more water on top of the decal to keep the squeegee moving. Smooth out any wrinkles. Finally, clean the decal and the edges of plate with a damp cloth so no slimy adhesive residue remains. Repeat steps 2 and 3 to transfer the images onto the rest of the glass plates. 4. To fuse the image to the surface, heat each plate decal-side-up in the oven at 200 degrees for 15 minutes, then increase the temperature to 250 degrees for 15 minutes. Finally, raise the temperature to 300 degrees and watch the decal closely. If a few bubbles appear on the surface, continue baking until they disappear. Remove the plate when the image “melts” and the finish has a hard, glazed appearance. Let the plate cool and wash it with warm soapy water. Tableware Tip: While it’s tempting to place the photo-decal on the front of the plate, it could get worn down after use. So make your hard work last by putting the image on the back. That way you can clearly see the photo through the plate, but your fork and knife won’t scratch your cute pet pic!